As a statutory consultee of Hertsmere Borough Council, the Radlett Society and Green Belt Association receives notifications of all planning applications submitted for sites in the Civil Parish of Aldenham. 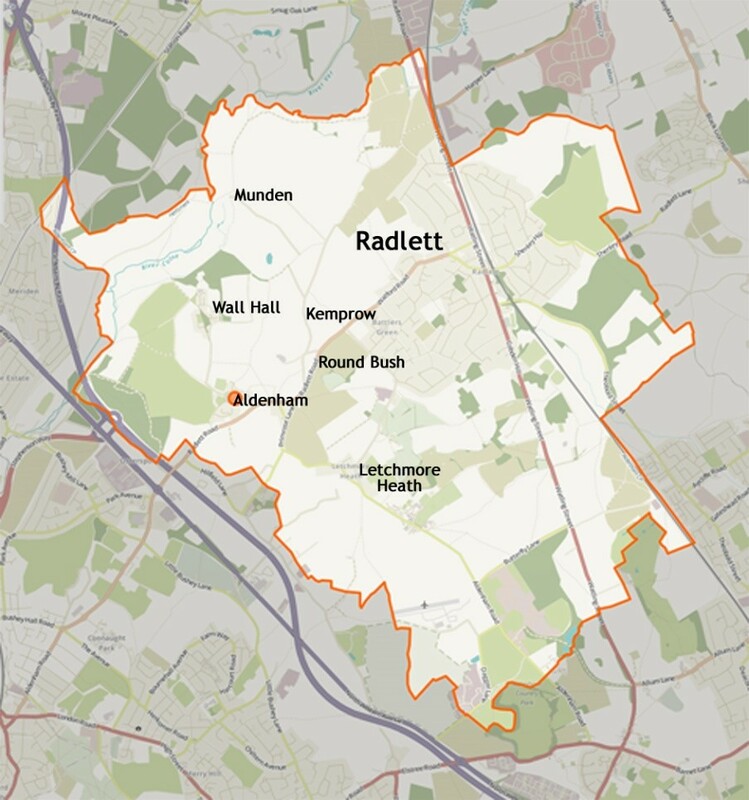 This covers Radlett, Aldenham, Wall Hall, Letchmore Heath, Round Bush, Munden and Kemprow. The number of applications received during 2014 was over 200- averaging 4 per week, requiring up to 2-3 members to consider the proposals and respond. Most numerous are applications to re-build or extend existing houses, followed by those for loft conversions. The volume of applications for new development is limited by the lack of vacant land in the area, but increasingly applications are being received to demolish older houses or bungalows and replace with larger properties with up to four floors of living accommodation. In the context of planning, the aim of The Society is to preserve the Green Belt and the quality of the built environment for the benefit of the whole community. The new planning process is not well understood by the public; therefore a short account is given here. When a planning application is made, it is normal for it to be submitted electronically on-line, via the Planning Portal of the Department for Communities and Local Government. http://www.planningportal.gov.uk/planning/applications/planningapplications. Full guidance is available on their web-pages. The Portal then transfers the application to the relevant LA [local authority] – in the case of CP Aldenham, that’s Hertsmere. When the Council receives the application, it is checked and validated. Notifications go out by email to statutory consultees, e.g. highways, the drainage authority, utility services and ourselves and a notification is posted to nearby neighbours and displayed outside the site. Hertsmere also places full details of the application on its web-site: http://www6.hertsmere.gov.uk/online-applications/search.do?action=simple&searchType=Application. If it relates to a Conservation area or the Green Belt, it will be published in the local press – Watford Observer. An eight-week target determination period then starts. Responses received within a 21-day period are considered by planning officers. The Society is in no different a position to any other party who makes comment on an application. These letters are a matter of public record and are available for scrutiny by any member of the public at the Hertsmere Civic Offices in Borehamwood. Due to the pressure imposed on the system by the volume of applications and the present government’s drive for growth, most of applications are dealt with by the Head of Planning under delegated powers. It is, however, open to any resident to ask their Borough Councillor to call in an application to the effect that it must be considered by the full Planning Committee. The borough-wide Committee meets monthly and discusses the larger and more contentious applications. Radlett is represented by up to two Councillors. In those cases where there is disquiet about an application, the Society will liaise with affected residents and the Councillors. In the case of major applications which go to appeal, the Society may make representations to the Planning Inspector; appear at a Public Inquiry or in extreme cases pay for expert representation at such an Inquiry out of the Society’s funds. In addition to the work involved with planning applications, the planners also involve the Society in changes of policy, seeking its views to establish the planning response to applications. Such issues as consent for telecom masts, mineral extraction, and the proliferation of front boundary walls and security gates to properties have been the subject of comment by the Society.